This situation occurred in the classroom of a student teacher during his student teaching. He worked very hard to create meaningful lessons for his students and often asked his mentor teacher for advice by asking questions similar to the one’s found at the end of this vignette. Mr. Sing presented equations like to his students. He demonstrated to them that they need only take the square root of each side to get x+1 = 3 or x +1 = -3. Then we can solve for x = 2 or x = -4. He then had his students solve some equations like the ones he presented and was surprised to find that many of the students were multiplying (x + 1)(x + 1) to get and then transforming this equation to and using factoring, (x + 4)(x - 2) = 0 to solve this equation. Mr. Sing notes, however, that many students were making mistakes in carrying out this procedure. He stops the class and reminds the students that they need only take the square root of both sides to solve these types of equations and then let's them continue working on the problems. A few days later, Mr. Sing grades the test covering this material and finds that many of his students are still not doing as he has suggested. At first he thinks that his students just didn't listen to him but then he reminds himself that during the class period the students seemed to be quite attentive. "Take sine to the minus one on both sides of the equation". Then one student wanted to know whether this is like dividing by sine on both sides. and then factor so the problem becomes ." A student in class said, "I do not understand why you can rewrite as . I did not know you could do that. Students in a second year algebra class have been working on using graphs as one tool in solving quadratic equations. When the students were solving linear equations, the teacher placed a lot of emphasis on generating and recognizing equivalent equations (e.g., 2x + 6 = 18 is equivalent to x = 6), but the students did not graph these equations to solve them. 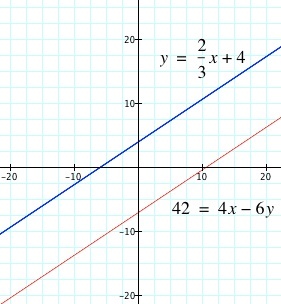 In their current work, one group of students contend that cannot be equivalent to because the graphs don’t look the same—in fact in graphing the first equation, you have to graph y = and the line y = 20, while in the second you graph and the line y = 0 (which you don’t really have to graph since it’s just the x-axis). Students in an algebra class have just finished a unit on exponential powers, including standard exponential rules and negative exponents. In completing a sheet of true/false questions, most of the students have classified the statement at the right as false. Students in an Algebra II class had been discussing the addition of matrices and had worked on several examples of n x n matrices. Most were proficient in finding the sum of two matrices. Toward the end of the class period, the teacher announced that they were going to being working on the multiplication of matrices, and challenged the students to find the product of two 3 x 3 matrices shown at the right. Students began to work on the problem by multiplying each corresponding term in a way similar to how they had added terms. 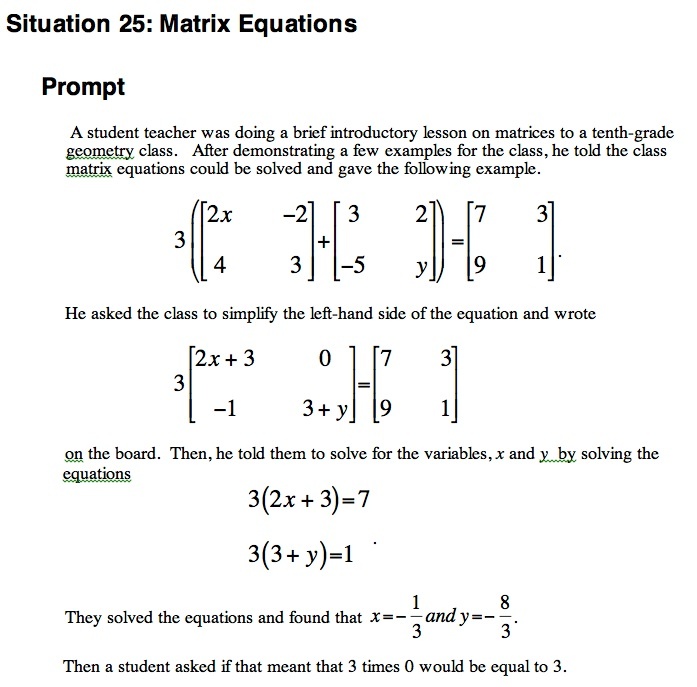 One student shared his work on the board getting a product that was the matrix shown at the right. As the period ended, the teacher asked students to return to the next period with comments about the proposed method of multiplying and alternative proposals. A mentor teacher and student teacher are discussing a student teacher’s lesson after it has been taught and the mentor is encouraging the student teacher to probe student thinking and to ask good questions. The class was solving simultaneous equations and the student teacher had chosen the fpair of equations at the right to discuss. 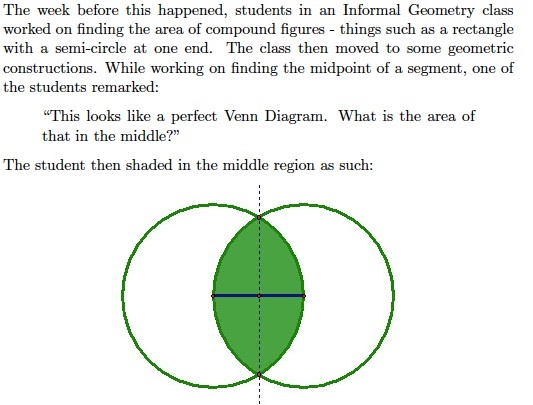 A high school student made a graph and responded that there was not a common solution because they were parallel, and the student teacher moved to the next problem. The mentor praised the student teacher for picking this pair of equations, which had no common solution, but urged him to ask follow-up questions. Construct a square whose area is half the area of square ABCD. The student chose the dimensions of ABCD to be 1 unit by 1 unit and approached the problem in two ways. She divided ABCD into smaller squares as shown in Figure 1a and noted each small square has area . Sketching a new square as in Figure 1b, she claimed a square has area . She concluded that the square she wants (sketched in Figure 1c) has a side length somewhere between one-half and three-fourths. Assuming implicitly that the area of given square ABCD is 1 square unit, she noted that the desired area of the new square is one-half square unit. Using a formula for the area of a square, she produced and then . When asked "Why did you switch the inequality sign?" the student said, "I don't know but I know I'm supposed to do that."